What is that is holding you back from your NEXT? What behavior(s) or attitudes are keeping you from that next big promotion or client? Which weaknesses are you giving more energy to that is not desired in the company culture set forth? We may can do the job better, know more, can multitask and make things happen, yet still get passed over for various reasons. You may say, “What does my Personal Brand have to do with it?” What really happens when I am doing all the right things that I believe is needed in my job or in my business, I am a team player and I am competent and proficient in my job and business, but what is holding me back from being promoted or going to the next level? Well, your Personal Brand has a lot to do with it, but do you know your BrandNique™ strengths and weaknesses of your Personal Brand? As a Professional Personal Brand Coachsultant, I am here to tell you it takes much more than being just another pretty or handsome face, nice dresser, team player, and a pleasant personality; but it takes some hard work and dedication to build a BrandNique™ Personal Brand that is going to take you where you desire to go, but it is going to take you putting forth an effort in your Personal and Professional Development. You cannot expect to change over night, because you have to first do the work of Self-Awareness, Personal Competence, Social Aliveness, and Relationship Management. As someone who knows what they want to do and have majority of the tools to get there, one must be willing to do the work and take responsibility to see what else can be done to enhance your Personal Brand. It is not all about what you know, but do you know what it takes to get to the next level? If not, do you have the tenacity to go and get it, perhaps: Study, Develop, Find a mentor, Do the Necessary Things without loosing your dignity to increase and build an BrandNique™ Personal Brand that starts from your very core of your being. Your Personal Brand has a lot more to do than just the surface, by virtue that may be fine, but the Inner work is what needs to be developed. You are great at what you do and you know it, yet there is always more to be done. You cannot stop where you are and expect that you have arrived. There is more work to be done and you must have the oomph to get up and make it happen by believing in you when you have no one else is in your corner. I have not touched the tip of the iceberg on this topic, because there is so much to discover about who you are, what you want to do and where you want to go either in your company or your business as it relates to your Personal Brand. The key is being willing to do the work and that may not always be the easy part; however, are you dedicated to do what is necessary to change, build or enhance your personal brand to get where you desire to be? As you think about your strengths and weaknesses, you would inquire with a least ten individuals who can give you some pointers on how are you perceived by them. Send them a quick email, survey monkey, or have a simple conversation of coffee to get their perspective. Don’t take what they said to heart to where you will shut down your friendship, but be open to receiving everything in love as a stepping stone to your next. Whether your brand is personal, business, leadership or a lifestyle brand, it should be providing a specific solution to your ideal client or organization! It's about being client focused and looking beyond just trying to make a dollar! What is the meaning behind your brand? Is it Transaction-Focused or Solution-Focused, and are you positioning it to look "Beyond the Moment" and into the future, where it can evolve as your ideal clients and opportunities evolve? Nowadays because businesses are popping up and the word "brands" is the craze buzzword, what is making yours stand out? Is it something that has meaning behind it or are you looking for the next big idea or opportunity? What are you doing in creating to move the world forward? If you have brand and it does not have true meaning behind it, do you think it's going to last? I always tell my clients..."People have to understand and know the story behind your brand in order to relate to it and have an emotional connection to it." Having a worthy, meaningful brand says that you know exactly what your clients or organization need and they are willing to seek you and pay you what you are worth... Why? Because they know you have what they need and developing a personal and or business brand that stands out and can be consistent and truly specific to something that your ideal clients are looking for, to bring about and it can be measured. I say this with all do sincerity "The most increasingly difficulty is differentiating between your brand and the speed with which contenders will grow in new innovations that will assist in the continued rising of your brand. You must stay Client, Solution and Future Focused to remain relevant to your specific market, but more importantly to your ideal client. Period!" Whatever you did to create your brand, you must think beyond that 100-fold, because with ideas and the speed of technology, you must stay top-of-mind in all of those areas you want to penetrate. So how do you do that? ~ Create a Reason For Your Clients to Need You…in other words a "Movement Not A Business"
~ Put Your Feelings Into It! ~ Be BrandNique™ by defining who you are and how you come to make a difference with your brand style. If you keep these things in mind as you create and build your brand, you will be on a great path to success. Defining, developing and designing a brand that shares your passion and meaning behind building something greater than just a transaction is what will last in the future. So ask yourself the question, "What Problem Is My Brand Solving?" And go after that! Take some time this week and reflect on how you can be more Intentional about investing in your yourself, brand lifestyle, and business…NOT efforting and trying to do something, but really create a plan of action to develop and become an unforgettable brand that others will recognize. How to Talk About What You Do! It is a New Year and what a better time to do discuss Personal Brand Confidence! This year is about Being BOLD and you cannot do that with poor confidence in yourself and the value you bring to the world. My January Theme is really diving deep about Confidence and how you can promote yourself without feeling a certain kind of way that will make others think you are vain. Is it is easy for you to talk about you and what you love doing for others? Or do you get tongue-tied in what you want to say, but cannot articulate it? If you are in a service business in particular, you should be able to speak clear about what it is that you love doing and how you come to serve others, as your confidence shows in your conversation, along with the energy you give off. For some it is hard to provide compelling solutions to attract their others that understand the language that propels them into action. Your message should be authentic and offer solutions to what they are desiring to receive, along with the benefits that are indeed important to both them and you. As you prepare your authentic personal branding message, there are a few things to think about first when creating it. You would need to be totally confident in who you are and what you are offering. If you are not confident, your energy will reflect it in your voice, body language and your tone. A business owner knows exactly what they want and who they desire to work with, so there is no time wasted especially, if you are offering a service which you should be leveraging your time for money. You know the struggle or the challenges that others face and you know how to speak the language that is easy for them to understand. This comes from building your community or tribe that shares the same common goals or instincts. Your message should not be pulling, but gently nudging to what is in the best interest of your clients. Although it is different for other people, because people receive information incongruously and have various perceptions of the same message. Therefore, be careful about what you are saying and how it relates to your brand. You need to develop a message about what you do and how you come to serve with three versions: short and sweet, medium length and a long length when you have time to elaborate. Know it without hesitation and stumbling. The more you have the opportunity to share, you will become more comfortable with what you are saying. Also, it may change over time because you and your business are always evolving. So if you are speaking to a different target market, keep in mind who they are and how they would receive what you are saying. Tailor it to fit your divine clients at that time, but don’t deviate from the core of your service or message where others will become confused. Take some time this week and reflect on how you can be more Intentional about investing in your yourself, brand, and business…NOT efforting and trying to do something, but really create a plan of action to develop and become your best self. If you want to discuss it, reach out to me via commenting below or visit my page and you can receive more engagement, tools and resources there. I do have a Private BrandNique™ Elite Group, where I show up giving you all of me, so reach out and touch! Enjoy your day! 5 Reasons To Create Your Personal Brand! When we see people on social media, what do you sense from them? What kind of energy or persona do you perceive them to be? Do you feel that they are authentic based on what you see via social media vs. what you get when you are in their presence or even in communication offline? Your personal brand follows you on and offline. Some don’t understand that what they “say and do” are a true reflection of their Personal Brand…it can be detrimental to their reputation. There are so many people out there who may be doing the same thing you are doing, but you are great and can differentiate you from the others...so you must be BrandNique™ in your own style and when they experience you. You cannot be anyone else, but you so if that means being quirky, funny, bubbly, or just being professional and down to the point, being that and be only you. 1. Create a Personal Brand Experience, so that when they encounter or engage with you, they are excited about the value you bring and you have a pleasant personality, and know how they are going to be able to progress in a relationship with you is important. Branding is about the whole experience when it comes to working with you. It is about being consistent to your audience and how they perceive you based on how they feel about you and what they know about you. For instance when they are in your presence or leave your presence; how would you want them to feel?... Inspired? Accomplished? Or Overwhelmed? Whatever that looks like for you, make sure you are consistent with being that...You! 2. LIKE & TRUST. We have all heard that if people TRUST and LIKE you, because if they can vibe, relate, or are attracted to your energy, you are most likely to have them as a divine client. Those who are your loyal customers and raving ambassadors. You get each other. Perhaps you shared a story that captures their attention or there is synergy; which attracts you together. 3. Always Be Consistent With Your Personal Brand, meaning with your brand colors, personality, the value you bring, and allow people to see who you are as a person. If your client or potential client sees you as someone that out of touch or not relational, then they may have a different perception of you and your brand. So always remember…you were always being watched and people are always noticing you and so you have to wear your brand every day by Being BrandNiquelly™ You! 4. Know Your Target Message…because you need to communicate that clearly to your niche audience or divine clients, so neither you nor your audience will be misunderstood. The more clarity you have about your divine clients, the better you are able to build products, services, and programs to provide a solution for them. You're a known expert in your field for solving that particular pain body or barrier that your divine clients need and your brand is speaking directly to that. 5. Really Be Intentional About Your Brand, your Business, and What You Put Out There On Social Media or When People Engage With You. When you are intentional about building your brand and your business you are not allowing yourself to be pulled in different directions that I do not honor you or your brand, which does include putting your hands to things that were not meant to, taking on the wrong client, or even partnering and collaborating with the wrong people. Know your BrandNique™ Worth and Be That! Building a consistent brand takes time; therefore, take the time to strategically plan how it looks and how you want to be perceived in your industry, fields, as an expert or a leader. Know yourself more intimately than you do, meaning know your true gifts, talents, treasure and the prize you are. The Law of Intentionality is all about doing something and taking action. It is not standing around hoping that something just happens, but it is taking ownership and responsibility of your own life, your personal brand, and how you chose to show up in the world and be who you are. Intentionality is making, building, and taking control and not just accepting whatever comes your way. To be intentional about building your personal brand from the inside out…is first getting to know you better, investing in you, doing what you need to do to make yourself better. When you take the time to reflect on who you are and who do you want to be along with how do you want show up and be fabulous in the world? Self-Development includes personal, professional and other investments you deem necessary into “YOU” to become the best “YOU” you can be! Your thoughts, values, morals, character, habits and communication, just to name a few, are all what make you special and unique, so you developing and enhancing those traits says a lot about you. When you are committed to investing in yourself, you will go further than a lot of people who just settle for being average and mediocre. That is fine for those who choose to be that, but that is NOT for leaders, eagles and those who aspire to be great. Being Intentional about your Personal Brand means you are taking the time and doing what you need to do to build, enhance, grow and not “Trying,” which is just “Efforting,". Trying and efforting means something is burdensome, trialing attempting, irritating, troublesome, bothersome, stressful, even unpleasant…so you get the point. Intentionality has deliberate, purposeful, conscious, willful, calculated knowing behind it. Do you get the point and see what I am saying when it comes to being intentional about your Personal Brand? You are not giving it over to someone else to tell you how far you can go or whether you can do something or not, perhaps not get an education or go after that promotion or contract. YOU define your destiny and YOUR brand by working hard to be all that YOU can be; taking full responsibility of what YOU do and how YOU want to make YOUR mark in the world. 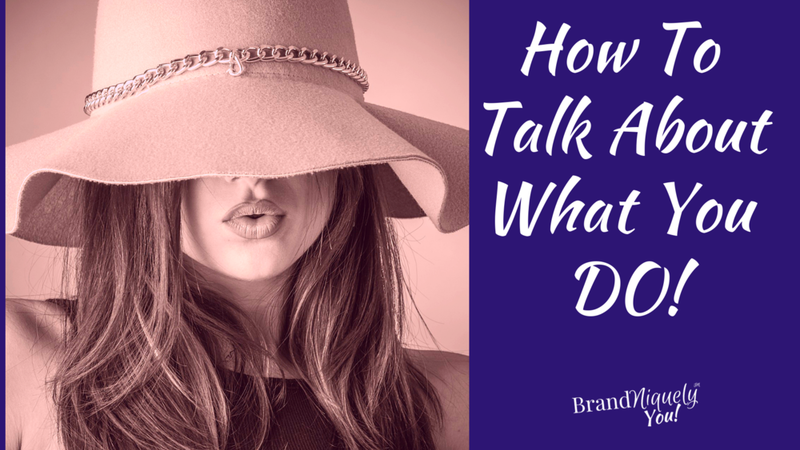 If you want to discuss it, reach out to me via commenting below or visit my facebook.com/BrandNiquelyYouInc page and you can receive more engagement, tools and resources there. I do have a Private BrandNIque™ Elite Group, where I show up giving you all of me, so reach out and touch me! Enjoy your day! Acknowledging What You Don’t Know! As a business owner or entrepreneur, there are so many hats to wear in order to operate and grow a successful business. But what does success look like for you? “BE” About Your Business and Your Brand! When you decided to start your business, you made a commitment to yourself and you shared it with your family, friends and the world that you are going to step out on faith and live your passion. When you decided to create a business that speaks to your purpose and passion, you are looking at it from the lenses of what “you” know, your experiences, education and other entities that sparked your love for what you do. However, when you are truly committed to this new venture, YOU MUST BE ABOUT YOUR BUSINESS AND YOUR BRAND!!! Which means taking your business and brand seriously!! When you are not quite sure about something, inquire with someone who has the expertise, you are making the investment in not just your business, but in yourself. So stop making excuses about getting it done. Take care of your business! When you say that you are going to do something, DO IT and FOLLOW THROUGH! All you have is your word when you are building your brand. Never underestimate what you are able to do, but know your limits, because promising something that you cannot deliver, will harm and tarnish your brand. Watch what you say at all times because people are always listening to you. Your words and actions play a huge role in your business and brand. Don't allow just anyone to speak against your brand. I encourage you to have a Brand Crisis Reputation Plan in place, just in case something were to happen with a client or even you may say something that will hurt your brand, as we are seeing with the world today with our leader recently. If you are just playing business and not sure that you are willing to build an authentic brand and business, then please don’t put yourself out there haphazardly, because it will come back to bite you. Do the necessary work to build on a solid foundation. You must control your Brand and BE About Your Business! I will be talking about this and other topics on BEING About Your Business and Brand over the next couple of weeks, because it is a subject which cannot be taken lightly at any point. I am very passionate about building an Authentic Personal Brand that speaks to who you are at the core and you must protect it at all cost. Have a Happy and Successful Branding Week! Relationship Marketing Wins When You Tell Your Story! Everyone has a story and when you tell your story it should be totally authentic and personable, as it relates to you and your brand. Marketing is now really about building relationships, tribes, communities and likeness around a particular idea, service, or product, interest or hobby. Creating a story that resonates with your divine clients, is what will get you to building a following and on your way to a solid marketing foundation that is built authentically. Your story is about you and how you view the world, industry or the alike. Marketing is now so relational and there is no way around it. If you are going to succeed in your business, it is my professional opinion that you actively participate in social media on some level. The market today is not about flashy advertising but about true, deep connection on a professional level. Your story connects you with others and it has reached new heights with social media, because everyone communicates in some form with it, rather to stay in touch, build a company or brand, and even to tell your story. In hearing your story, you open up the world to your truth and how you live out your authentic lifestyle, you are giving the “open door” effect to your business. You must be careful as to how you tell your story because it should be real, valid, authentic and somewhat life-changing, as it depends on your purpose and intent of what you are sharing. The intentions of your story should be able to relate to a specific person, thing or outcome that your potential divine client can relate to. A story is a point in time that you could share that could possibly be the reason as to how or why you decided to begin your own business or organization. One should own your story and you shall be the one who tells it, so that you can control your words, emotions and the intentions because who you deliver it will determine the perceptions of your brand. However, be enthusiastic and share with feelings about it because it your connection with your divine clients and the world. Relationship marketing is about engaging and delivering with your divine clients with stories that can spread positively. What is my overall goal you want to achieve with your audience? How do you want to connect with them? Personally, Professionally, or other? What is the audience you would like to share with? Demographics, Firmographics, Special Interest, Roles,etc.? Who do you read want to serve and how after you share your story? How can I create my story that connects in a positive way? What action do you want them to take once you share? Sharing is what provides open doors for relationships and connectivity. It is the foundation of what you are building on for engagement, because people would love to see and know who they are working with and why you do what you do. Connection and communication are both the glue that all business and personal relationships are built upon. Therefore, be strategic on what and how you share your story. Own It! Live It! and Be Your Brand Story because who else can do it like you do? When you connect with others on an authentic level, your clients will “get it” and they will understand the notion behind what it is that you do. Design a Brand Story That Shares Exactly Who You Are!!! When growing a business it takes a lot of time and dedication to commit to your dream. A business cannot grow nor sustain without clients or customers who like, love and know about your product. Therefore, building a business based on relationships is key to the survival these days with all of the social media and the premise that it is based on “RELATIONSHIPS”. As a business owner Relationship Marketing must be a part of your marketing strategy in order to maintain customer retention. Relationship Marketing is the organizational commitment to developing and enhancing long-term mutually beneficial relationships with profitable or potentially profitable customers. As in the past businesses were determining the value of their customers based on their most recent transaction or purchase. This transaction could be one time or it could be multiple times but the relationship was not cultivated and the exchange was the focus. Today, it has become more important for companies to focus their efforts on building a communications strategy that includes a strong emphasis on "Connection." Connecting and Communication is crucial to any organization and your client base as it increases influence and impact. The primary goal for creating customer relationships is to increase your customer loyalty and retention. It is a long-term thinking process that should be understood and not limited. A company could lose up to 50% of its customers over a five year period. Just a small increase in customer retention rates can have a profound impact on a business’s bottom line. It costs 6-7 times more to recruit or obtain a new customer than it does to retain your existing customers. It has been stated that to differentiate yourself from the crowd there are three major things: (1) your core business model, (2) price, (3) your total relationship and customer experience. These three things are unique to you and you have to know what that looks like for you and your business. As the business environment and the competition gets more competitive, the importance becomes how strong is your relationships with your customers and what does it require to maintain that relationship. As I said "relationships are so important to business’s bottom line profit." When you begin to look at relationship marketing there must be a committed effort on your part that is ongoing and consistent. A relationship requires authenticity, dedication and a commitment to getting to know your customer including their wants, needs, desires, likes and dislikes to say the least. It is more about investing time and energy to cultivating a long lasting relationship that will create brand loyalty and satisfaction. Seek to establish a business community with loyal customers, brand awareness and profit. This requires a long-term plan and the proper investment to build a strong brand that potential clients can recognize and keep faithful to. As you grow your business based on relationships, it is important that (1) your customers understand the benefits that you offer; (2) the advantages of working with you and (3) the construction of building brand loyalty program. Loyalty is the ultimate goal of relationship marketing and can be comparable to influence of satisfaction of customers who are not only loyal, but also would not mind positive word-of-mouth advertising. With deepened relationships and greater efforts of retention, customers will stay with the company longer and creates an opportunity for a better foundation of providing quality and value. Begin, if you are not implementing Relationship Marketing into your marketing strategy, because with how social media is the new normal, you are missing out on a great deal of business and great relationships. As you find which channel is best for you to communicate and build relationships with your clients and prospects, be authentic and open to learning. "Be Intentional about building your personal brand from the inside out..."
If you want to discuss it, reach out to me via commenting below or visit my facebook.com/ElyshiaBrooksInc page and you can receive more engagement, tools and resources there. I do have a Private BrandNIque™ Elite Group, where I show up giving you all of me, so reach out and touch me! Enjoy your day!